Antique Brass 5" Floating House Number - - made of solid cast brass. Attach directly to a wall to display your address in elegant style. To achieve a "floating" look, leave a portion of the mounting hardware projecting from the wall. Will install without holes or unsightly screw heads exposed for a nice, clean look. Can also be mounted flush with the wall if preferred. Includes installation instructions, screws, and standard mounting hardware. NOTE: For vinyl siding additional mounting material maybe necessary. Due to the slant of the siding the customer may need to place mollies or something else to stabilize the numbers. Please select the numerals desired (one at a time) above. If you need multiples of a particular numeral, please use the quantity box. 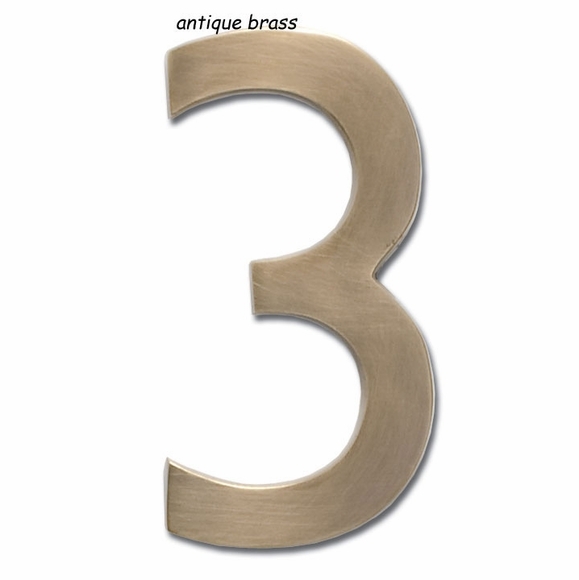 In addition to antique brass, the 5" floating number comes in these other finishes: antique pewter, polished brass, black, antique copper, dark aged copper, and satin nickel. If the numbers you need are not available in antique brass, you might want to check current availability in the other finishes (see Related Products).